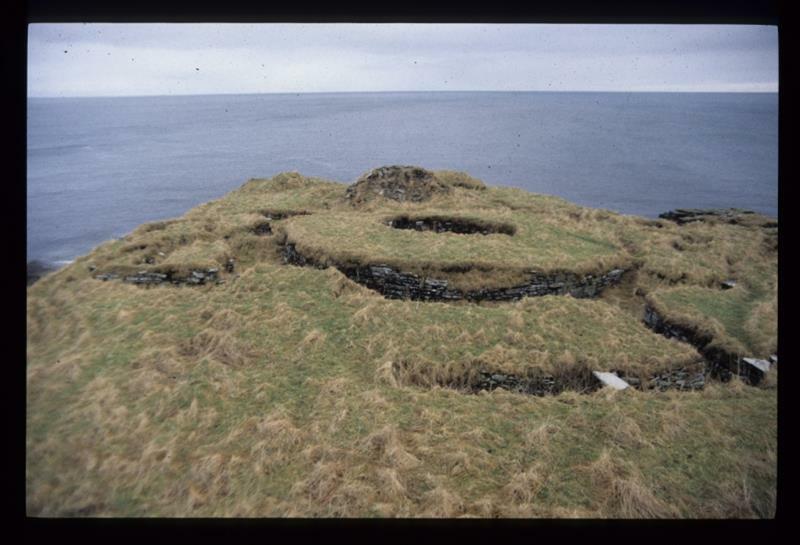 A broch settlement situated on a cliff promontory with an enclosing rampart. 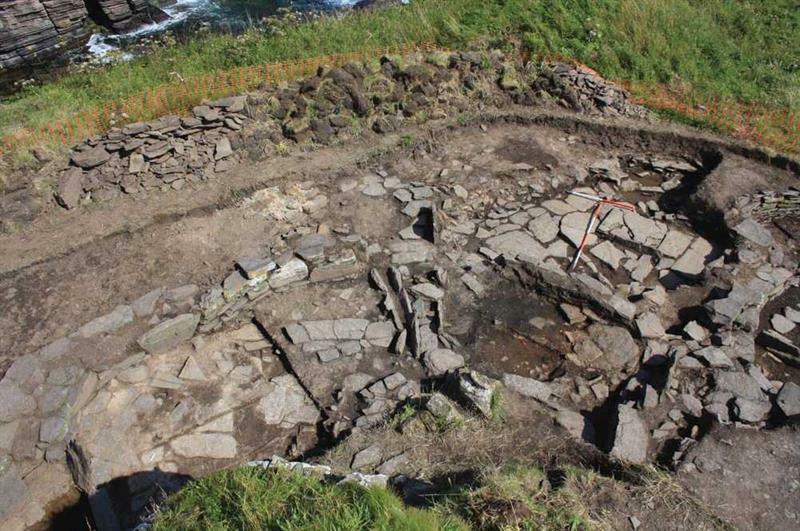 The site consists of an Atlantic roundhouse with numerous external outbuildings. 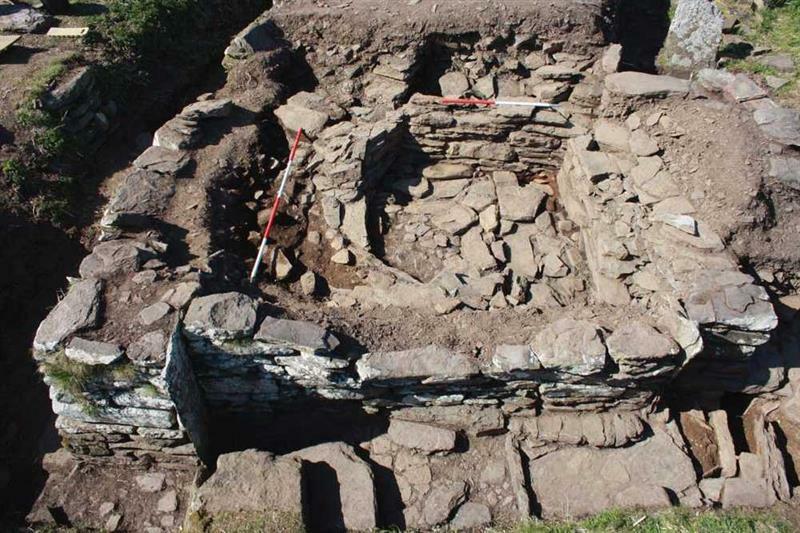 Nybster Broch is generally as described and planned by the previous authorities. 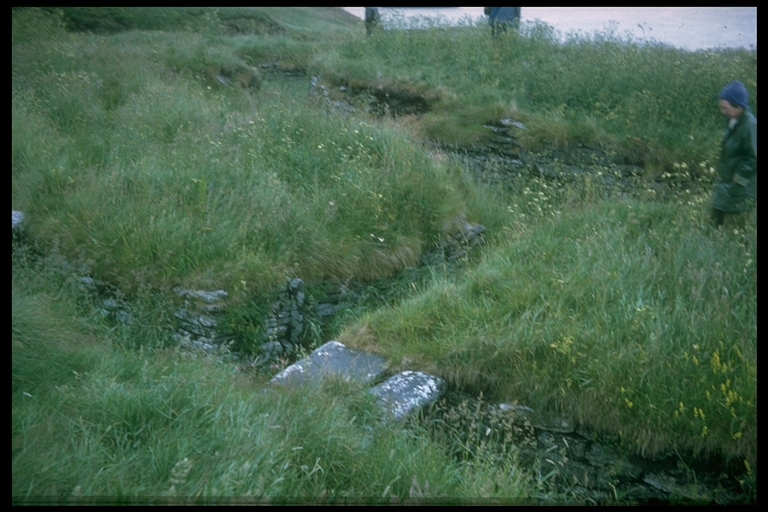 The excavations were not backfilled and most of the walling is exposed, albeit heavily overgrown. 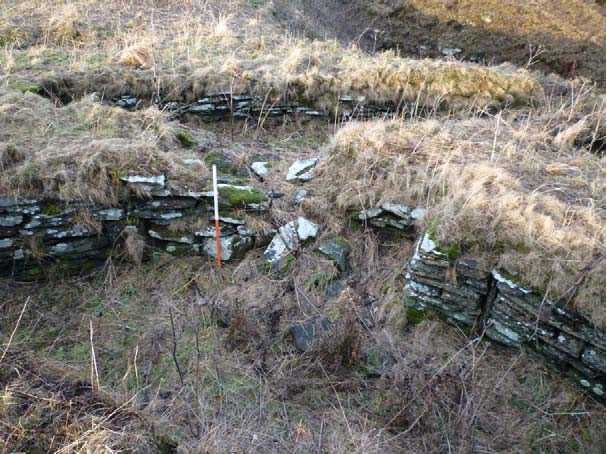 The previous field investigator noted 'secondary defensive banks and walls' immediately W of forework. 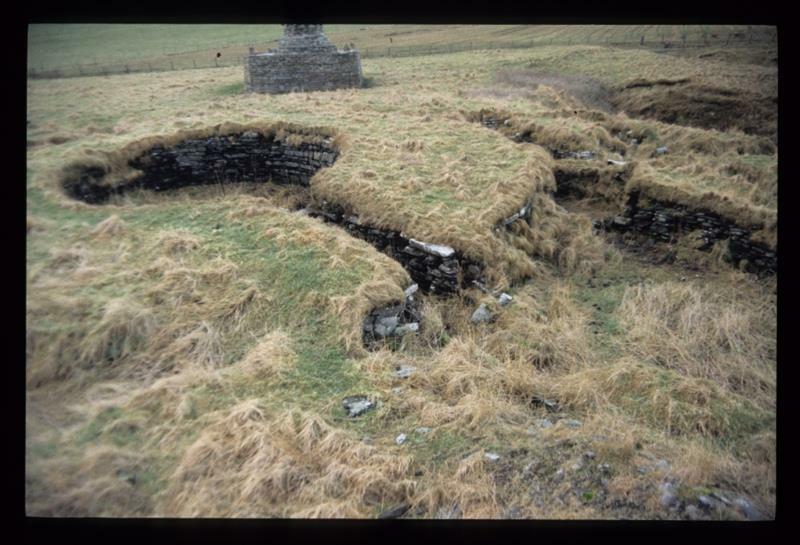 These have been completely levelled, but they were almost certainly fairly modern, perhaps spoil heaps, as RCAHMS did not plan them, and they formed no logical pattern with the broch and its outer defences. Revised at 1:2500. Visited by OS (N K B) 22 July 1982. 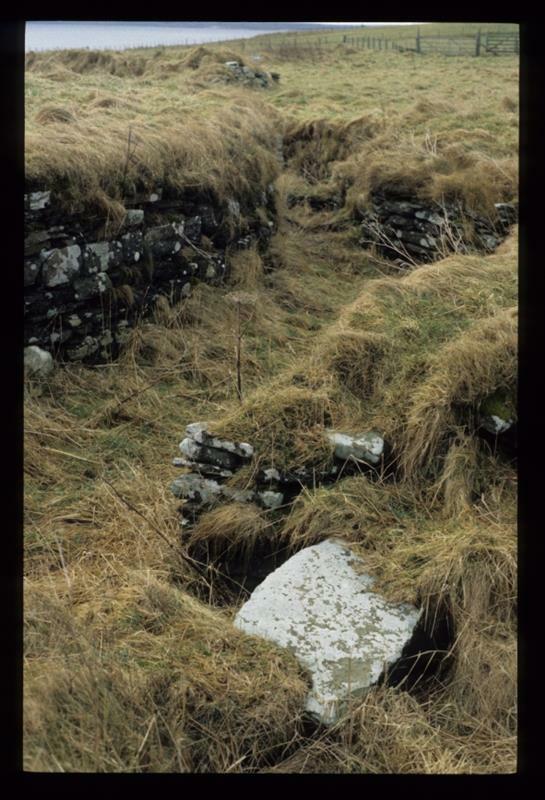 A site visit was carried out by Historic Scotland in August 1997 to assess the condition of the site and the need for management and conservation. Note: OS Mastermap appears to be incorrect for this area. 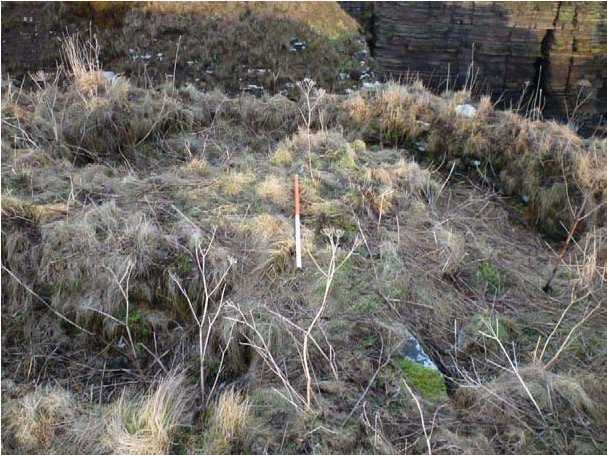 GIS data as supplied: larger season 2 shape does not match site plan. <1> Text/Publication/Article: Anderson, J. 1901. 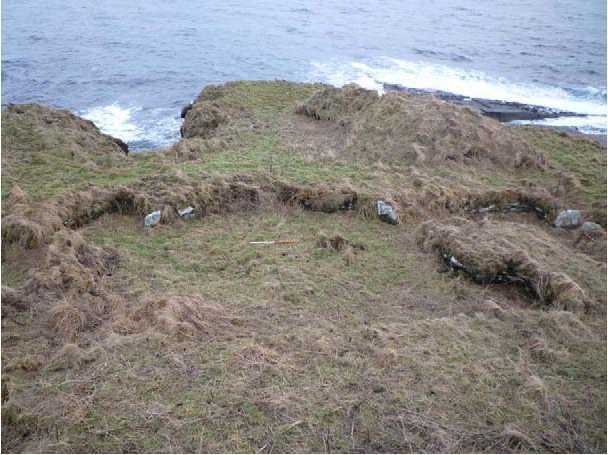 'Notices of nine Brochs along the Caithness coast from Keiss Bay to Skirza Head, excavated by Sir Francis Tress Barry, Bart., MP., of Keiss Castle, Caithness', Proc Soc Antiq Scot Vol. 35 1900-1, p.112-48. 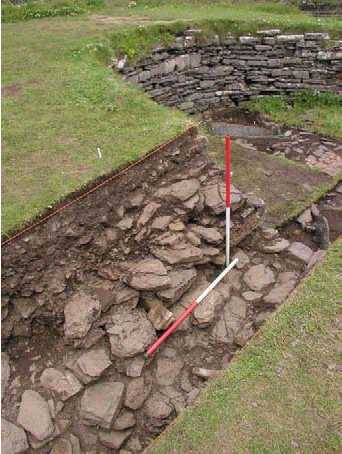 Proc Soc Antiq Scot. 112-48. 139-42. 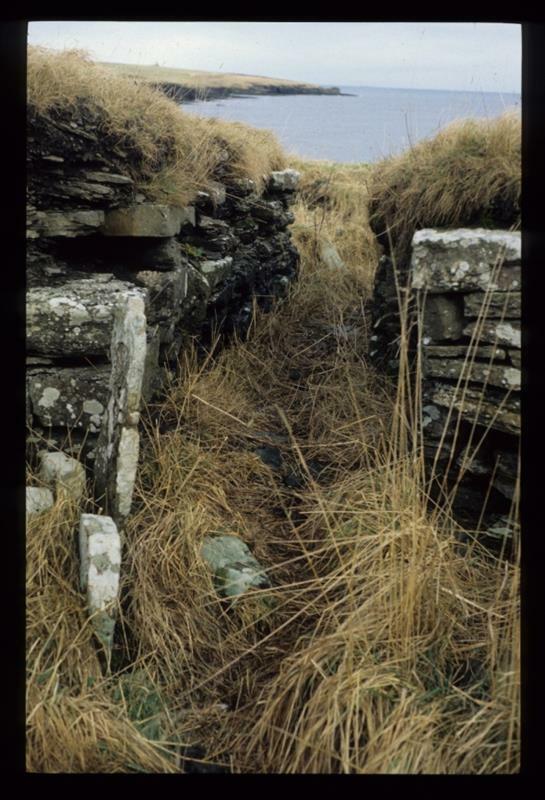 <2> Text/Report: RCAHMS. 1911. 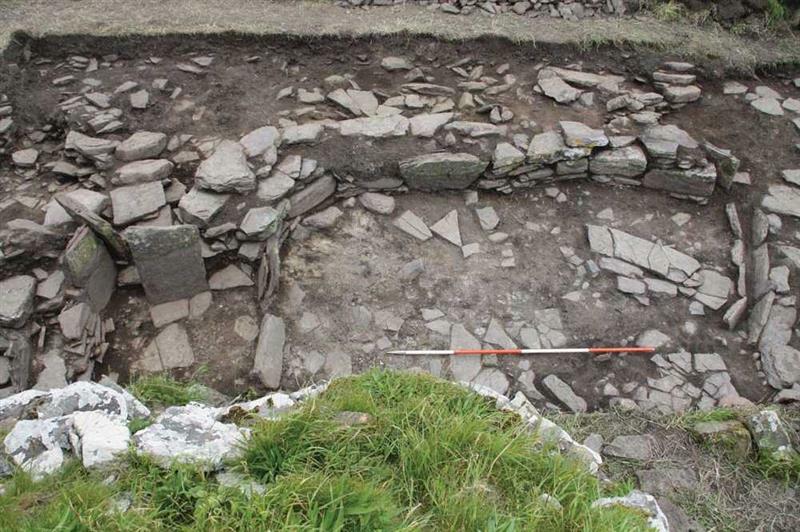 The Royal Commission on the Ancient and Historical Monuments and Constructions of Scotland. 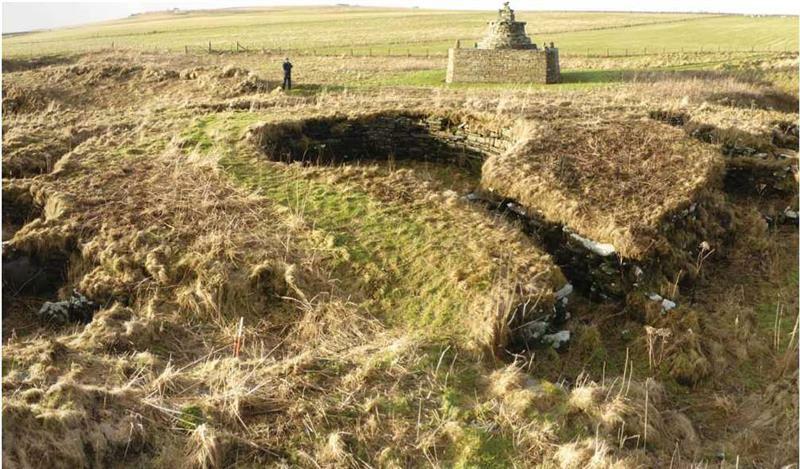 Third report and inventory of monuments and constructions in the county of Caithness. . 159-60, No. 518; plan. <3> Text/Publication/Article: Young, A. 1964. 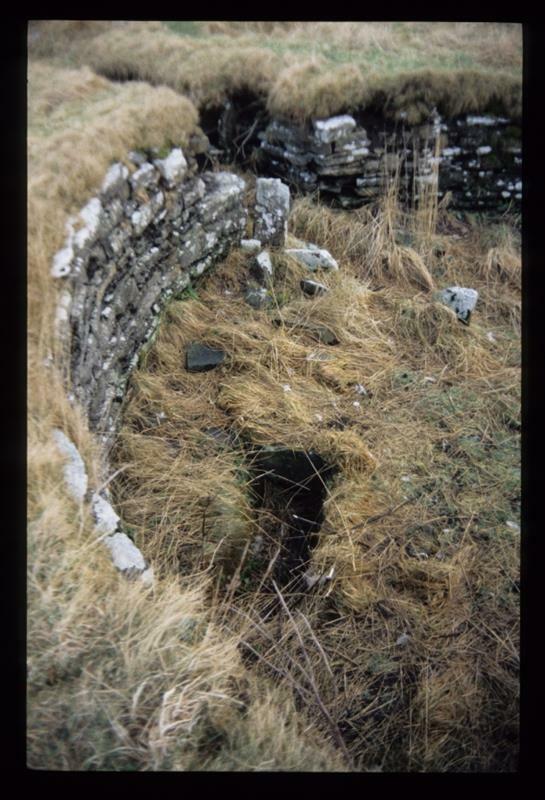 'Brochs and duns', Proc Soc Antiq Scot Vol. 95 1961-2, p.171-98. 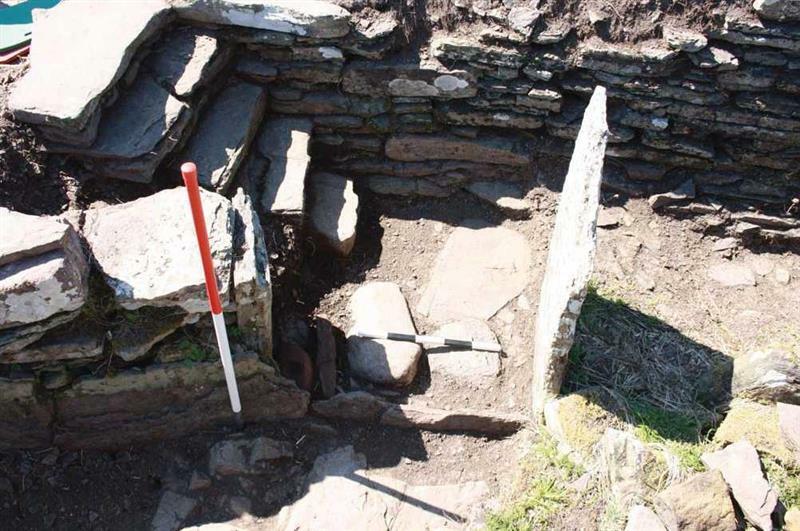 Proc Soc Antiq Scot. 171-98. 184, No. 15. <4> Text/Publication/Article: Robertson, A S. 1970. 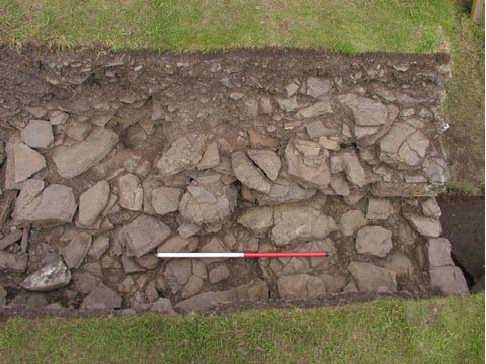 'Roman finds from non-Roman sites in Scotland', Britannia Vol. 1 1970, p.198-226. Britannia. 198-226. table 2. <5> Text/Publication/Article: Hartley, B R. 1972. 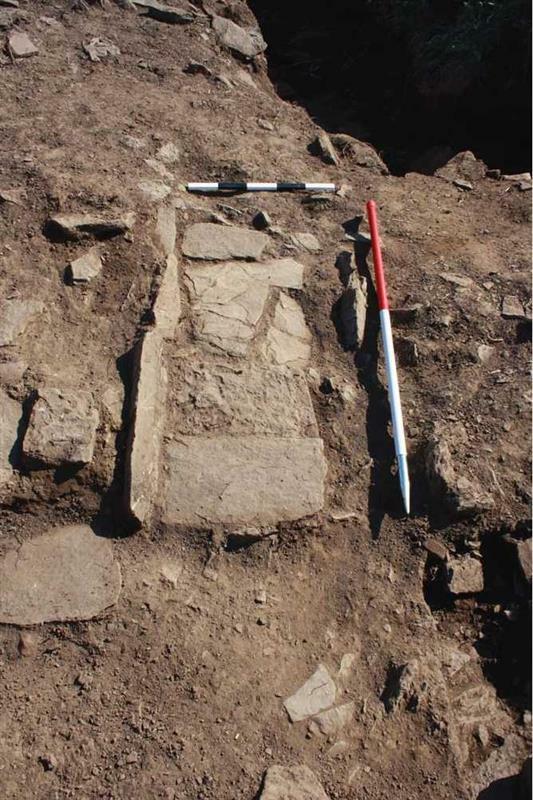 'The Roman occupations of Scotland: the evidence of samian ware', Britannia Vol. 3 1972, p.1-55. Britannia. 1-55. 54, No. 2. 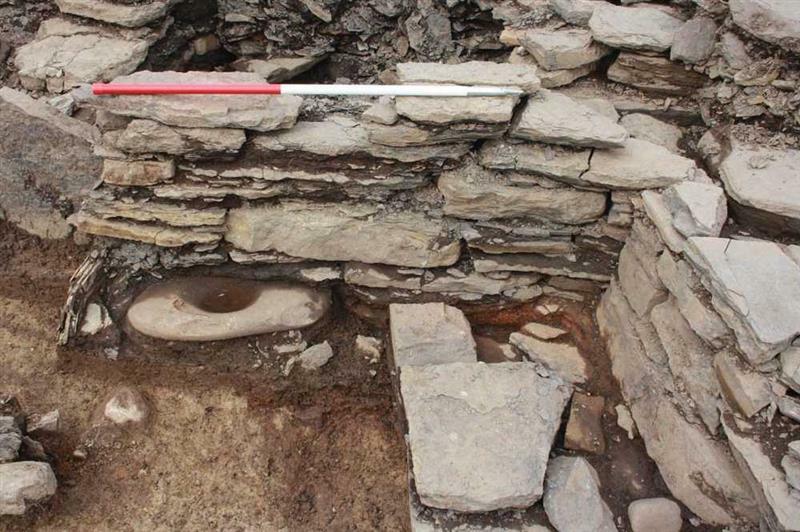 <6> Image/Photograph(s): Highland Council. 1970-1980?. 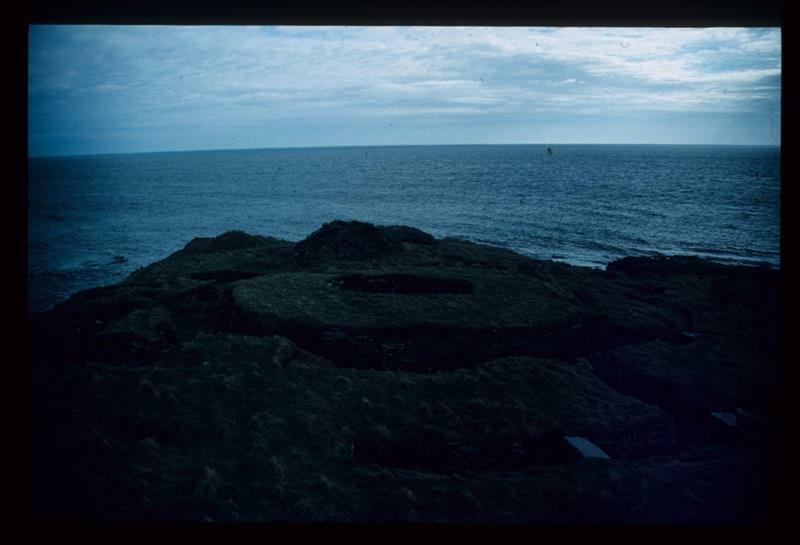 Nybster Broch: Outworks. Colour Slide; Digital Image. . Original & digital. 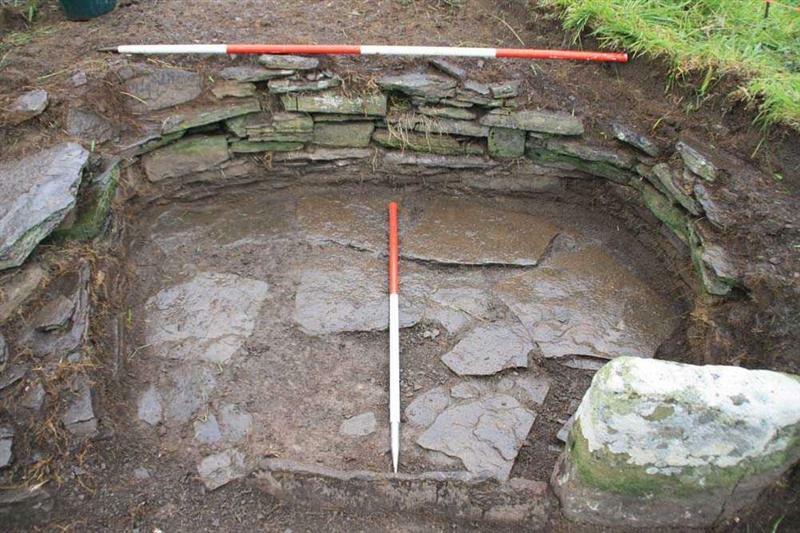 <7> Image/Photograph(s): Highland Council. ?. 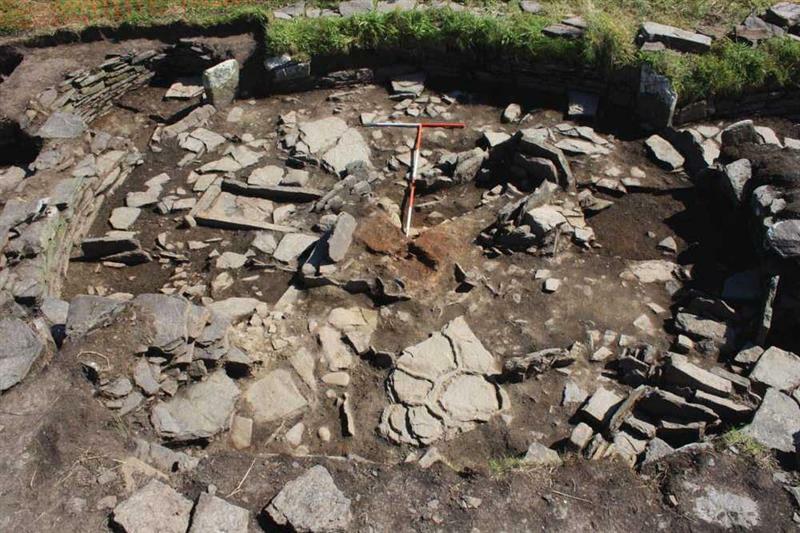 Nybster broch: View of roundhouse, facing west. Unknown. . Original & digital. <8> Text/Publication/Monograph: Lamb, R G. 1980. 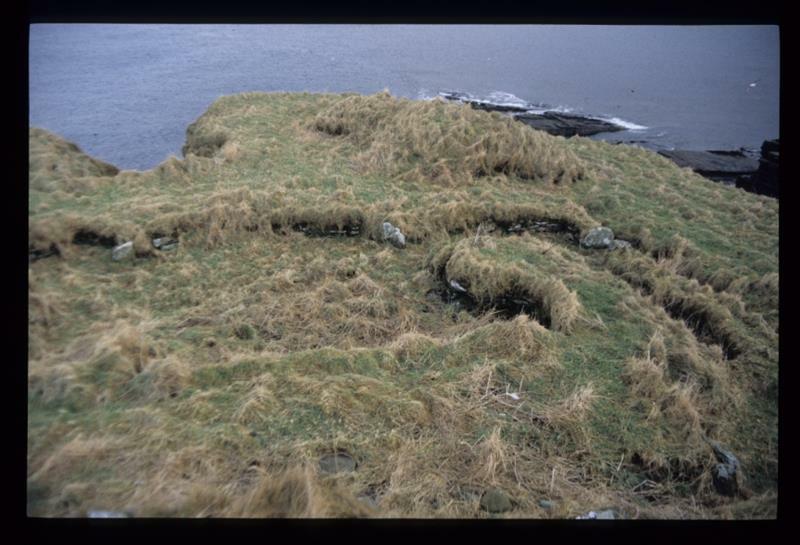 Iron Age promontory forts in the Northern Isles. BAR British Series. 79. 11-75; plan. <9> Text/Publication/Article: Gourlay, R B. 1981. 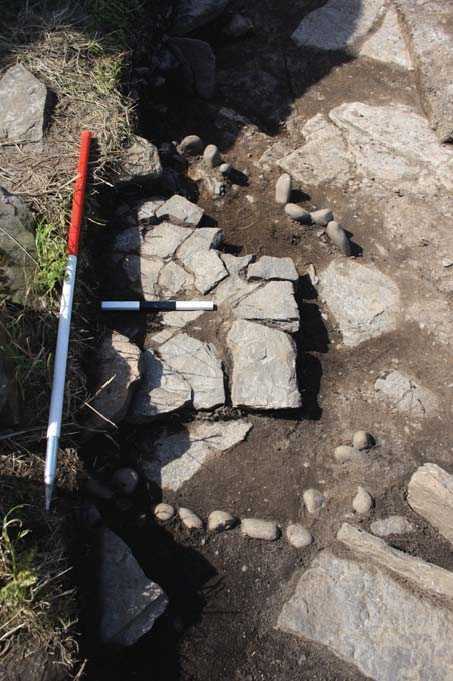 'Brough Head, Nybster (Wick p) potsherds', Discovery and Excavation in Scotland 1981, p.18. 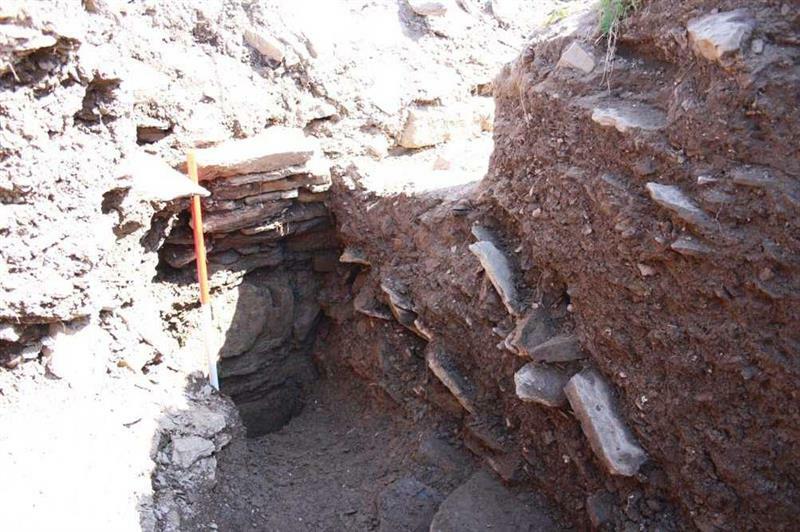 Discovery and Excavation in Scotland. 18. 18. 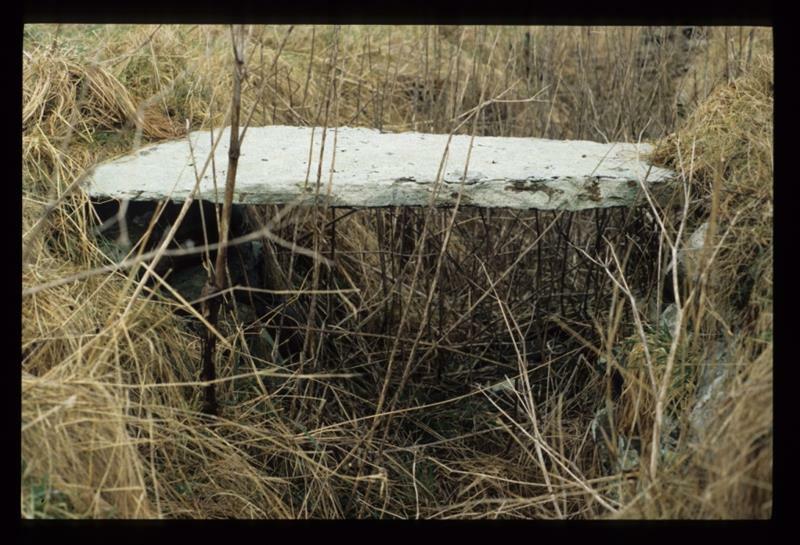 <10> Text/Report/Fieldwork Report: Batey, C E. 1981. 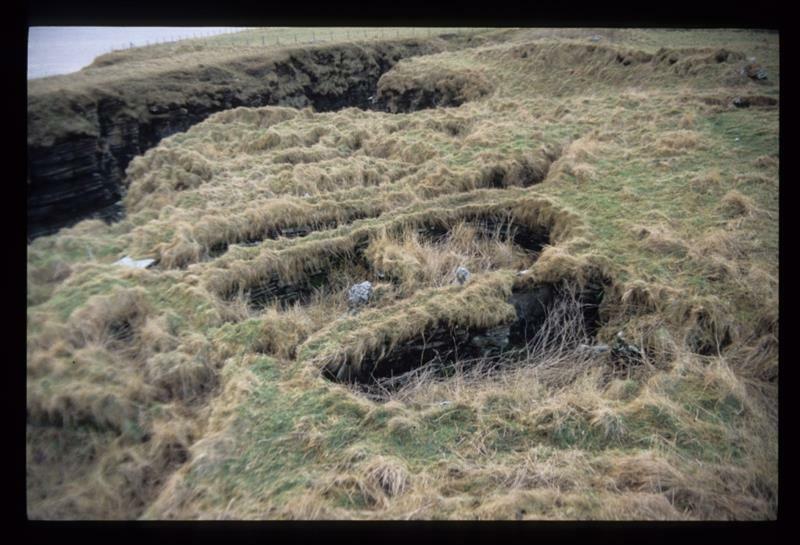 Caithness coastal survey 1981: interim report. 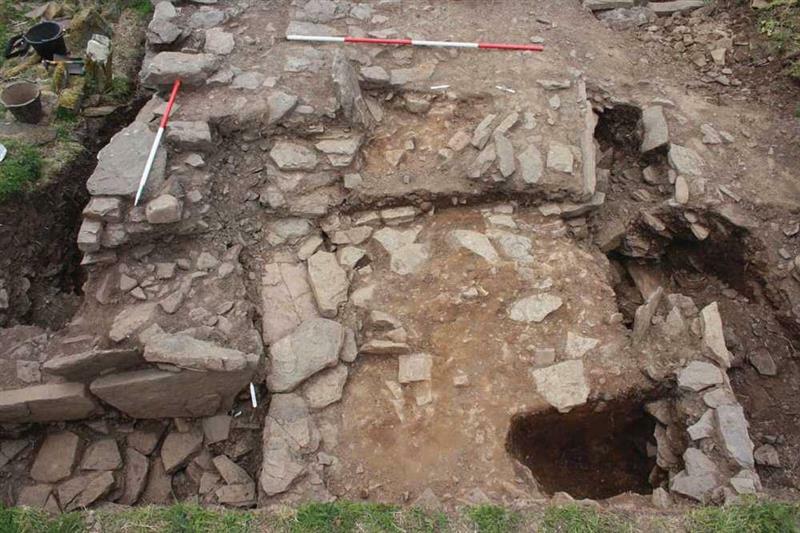 University of Durham, Department of Archaeology. . No. 91. <11> Image/Photograph(s): Gourlay, R. 1987. 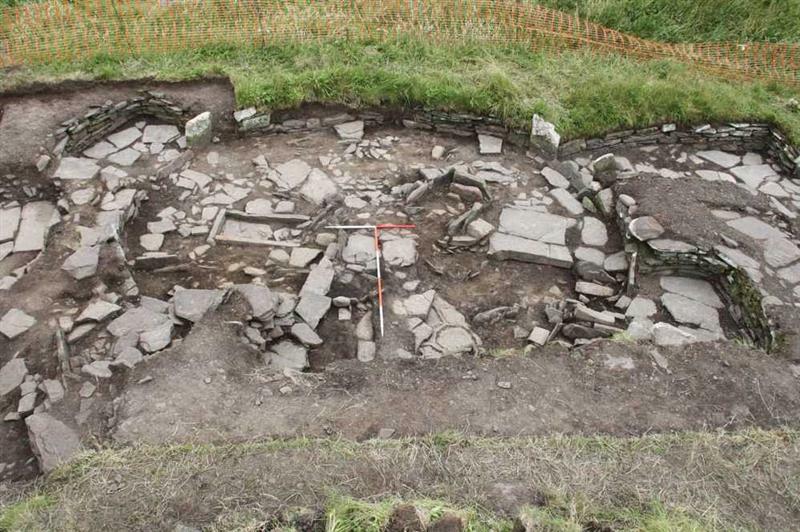 Nybster Broch: Car park. B/W Negative. .
<12> Image/Photograph(s): Highand Council. 1998?. 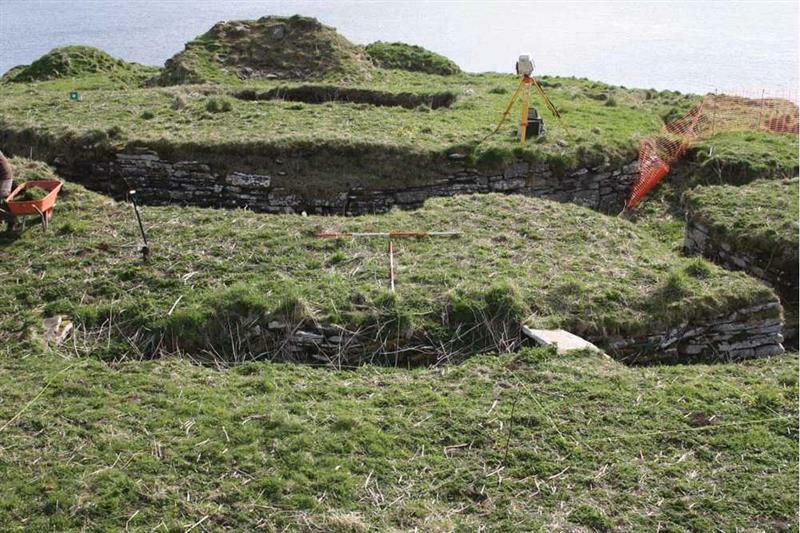 Nybster Broch: general view of roundhouse, facing east. Colour Slide; Digital Image. . Original & digital. <13> Image/Photograph(s): Highland Council. 1998?. 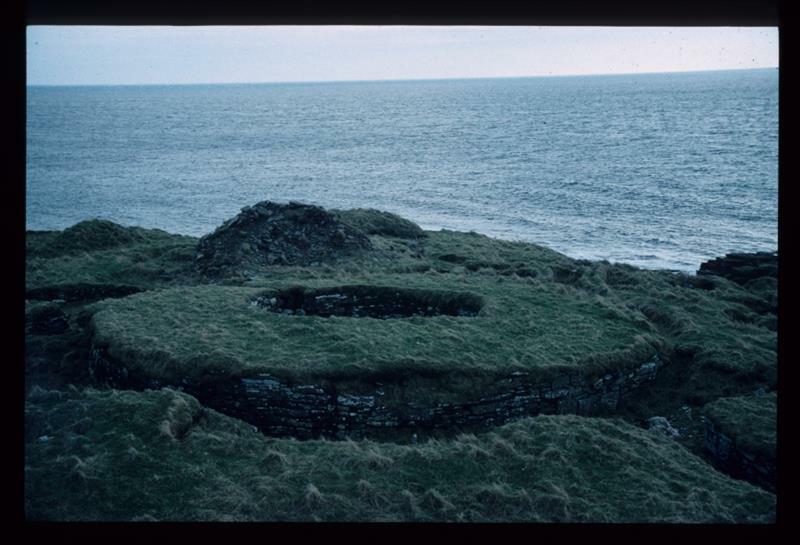 Nybster Broch: Roundhouse, facing east. Colour Slide; Digital Image. . Original & digital. 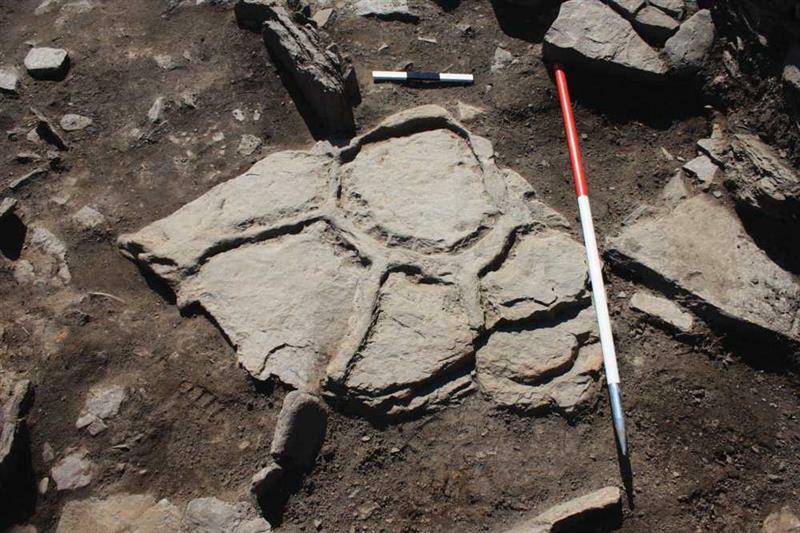 <14> Image/Photograph(s): Highland Council. 2000?. 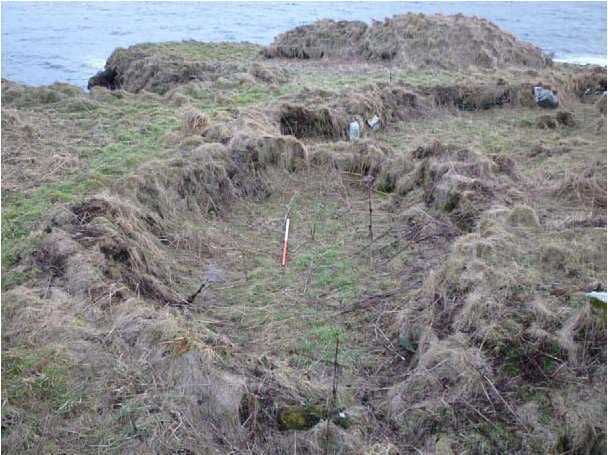 Nybster Broch: General view of site. Colour Slide; Digital Image. . Original & digital. 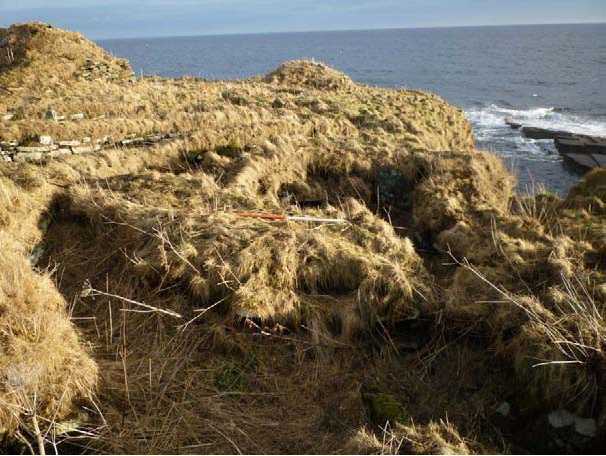 <15> Image/Photograph(s): Highland Council. 2000?. 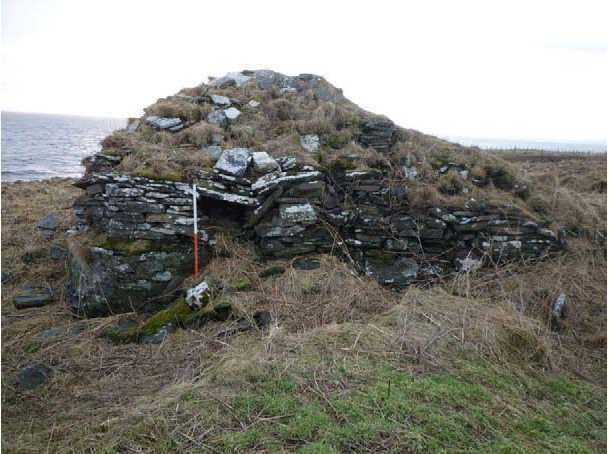 Nybster Broch - Roundhouse and remains of original Mervyn Tower, facing east. Colour Slide; Digital Image. . Original & digital. 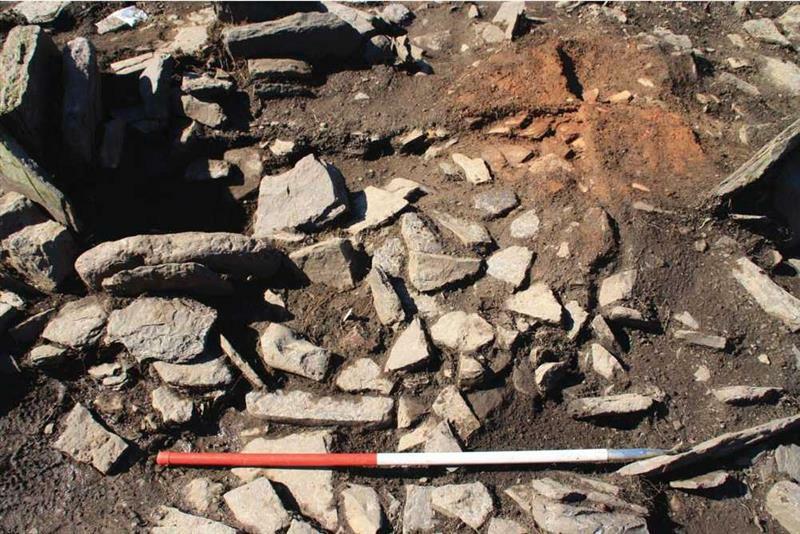 <16> Image/Photograph(s): Highland Council. 2000?. 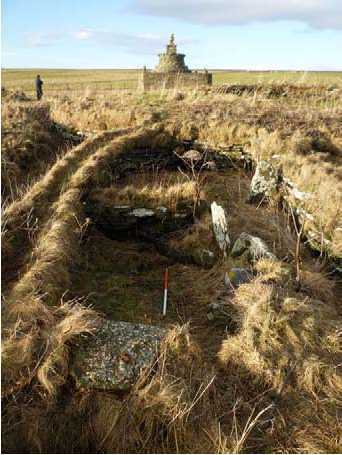 Nybster Broch - Roundhouse, settlement and remains of original Mervyn Tower, facing east. Colour Slide; Digital Image. . Original & digital. <17> Image/Photograph(s): Highland Council. 2000?. 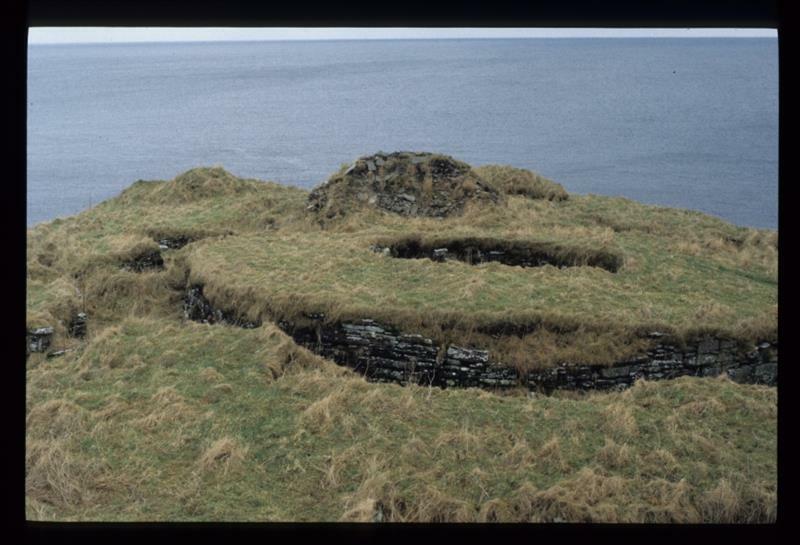 Nybster Broch - Roundhouse and rampart, facing southeast. Colour Slide; Digital Image. . Original & digital. <18> Image/Photograph(s): Highand Council. 2000?. 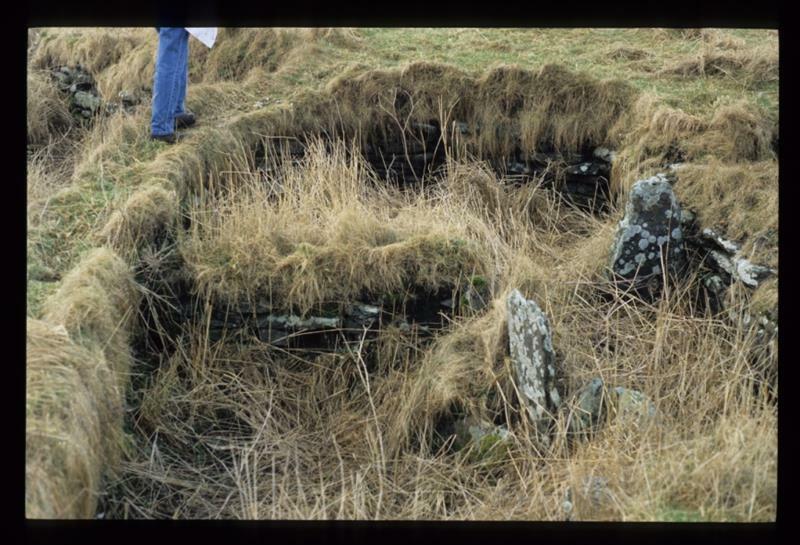 Nybster Broch - Internal features of roundhouse. Colour Slide; Digital Image. . Original & digital. 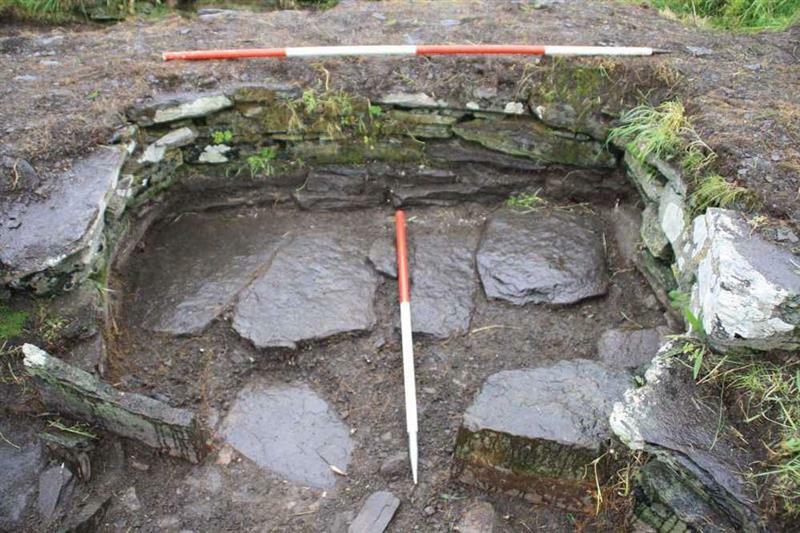 <19> Image/Photograph(s): Highland Council. 2000?. 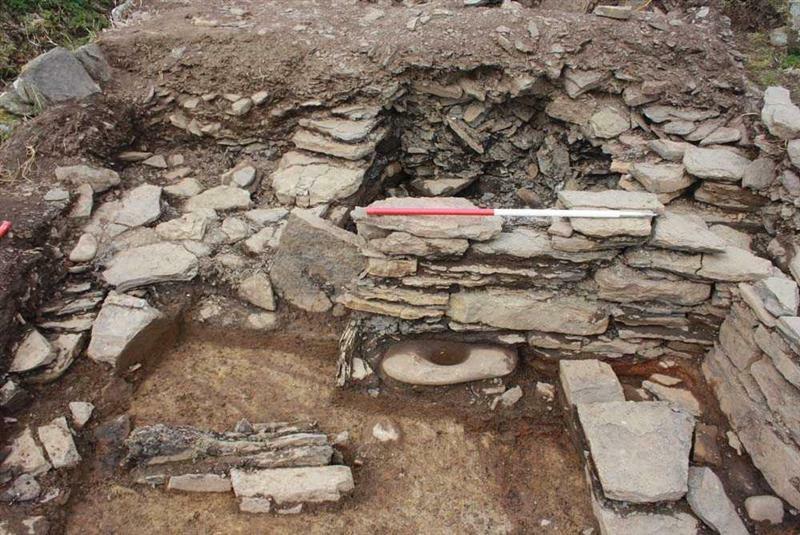 Nybster Broch - Inside view of roundhouse. Colour Slide; Digital Image. . Original & digital. <20> Image/Photograph(s): Highand Council. 2000?. 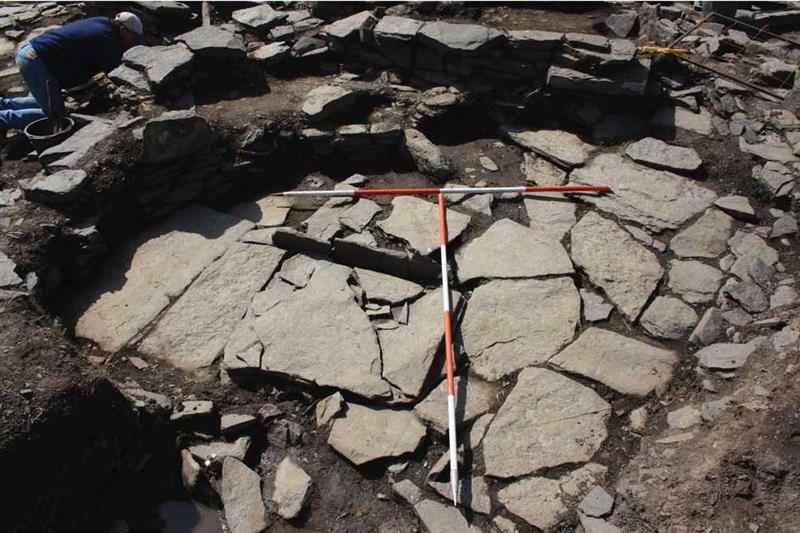 Nybster Broch - Internal view of the roundhouse, facing south. Colour Slide; Digital Image. . Original & digital. <21> Image/Photograph(s): Highand Council. 2000?. 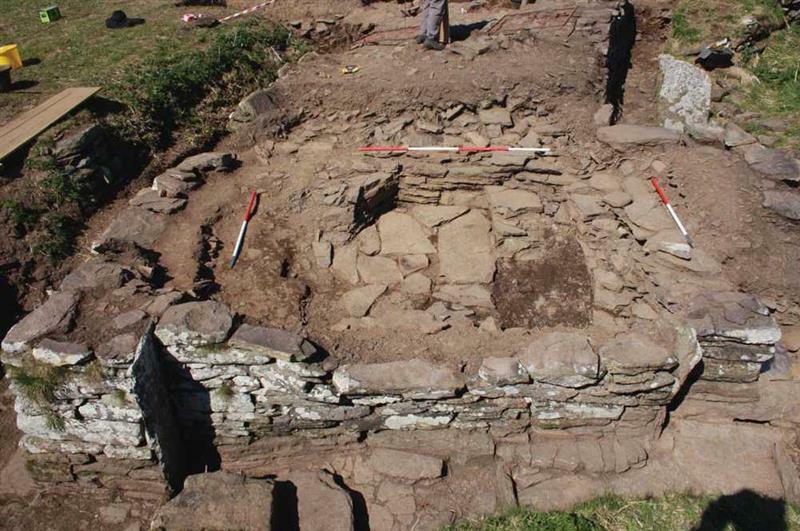 Nybster Broch - Roundhouse with Mervyn's Tower behind, facing west. Colour Slide; Digital Image. . Original & digital. <22> Image/Photograph(s): Highland Council. 2000?. 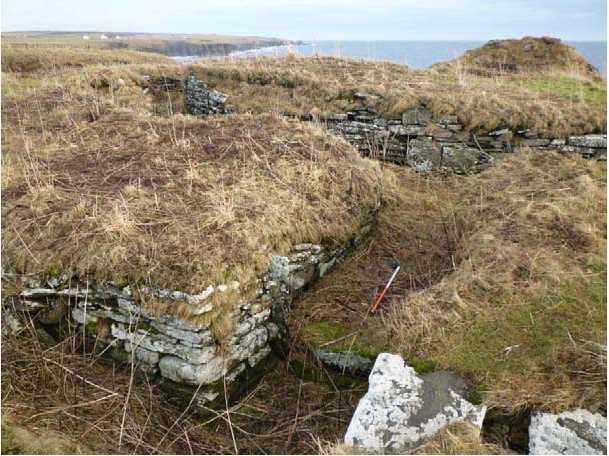 Nybster Broch - Outbuildings to east of roundhouse, facing southeast. Colour Slide; Digital Image. . Original & digital. <23> Image/Photograph(s): Highand Council. 2000?. 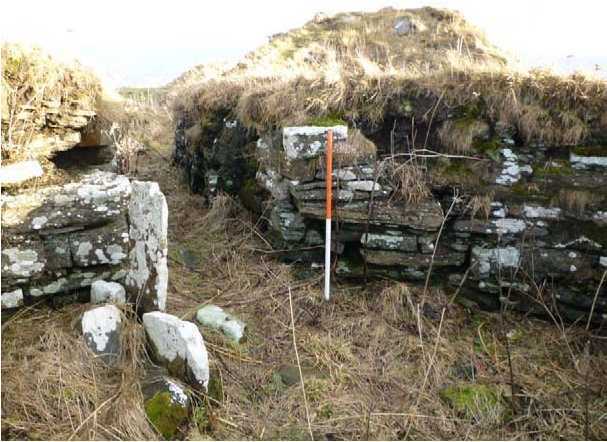 Nybster Broch - Outbuildings to the east of roundhouse, facing east. Colour Slide; Digital Image. . Original & digital. <24> Image/Photograph(s): Highland Council. 2000?. 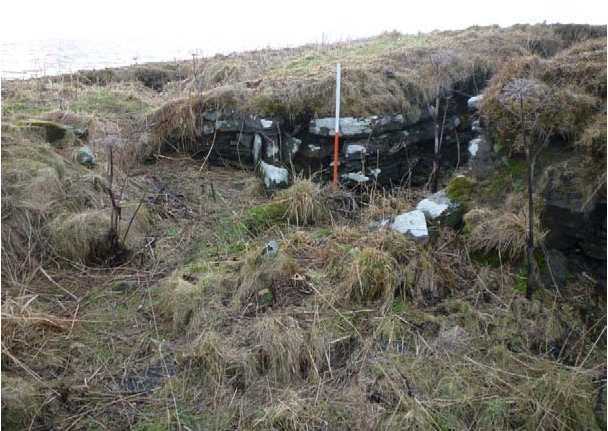 Nybster Broch - Outbuilding to immediate southeast of roundhouse, showing internal features. Colour Slide; Digital Image. . Original & digital. <25> Image/Photograph(s): Highand Council. 2000?. 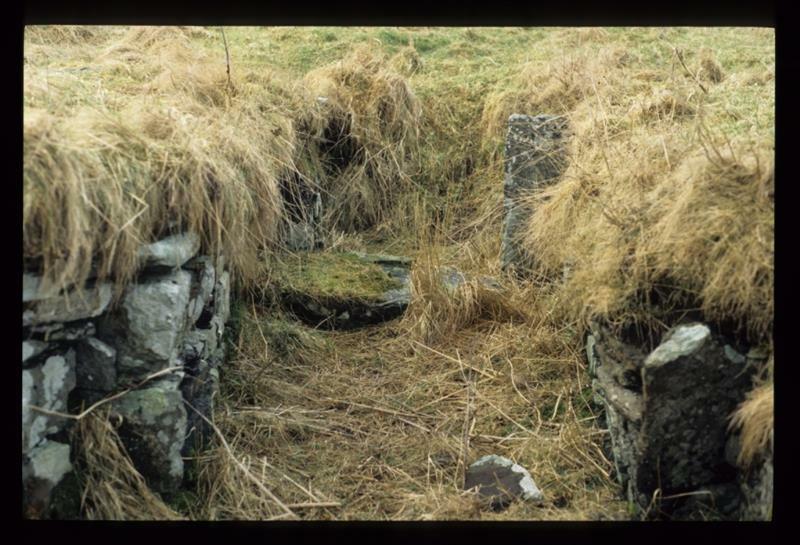 Nybster Broch - Outbuildings, internal features. Colour Slide; Digital Image. . Original & digital. <26> Image/Photograph(s): Highland Council. 2000?. 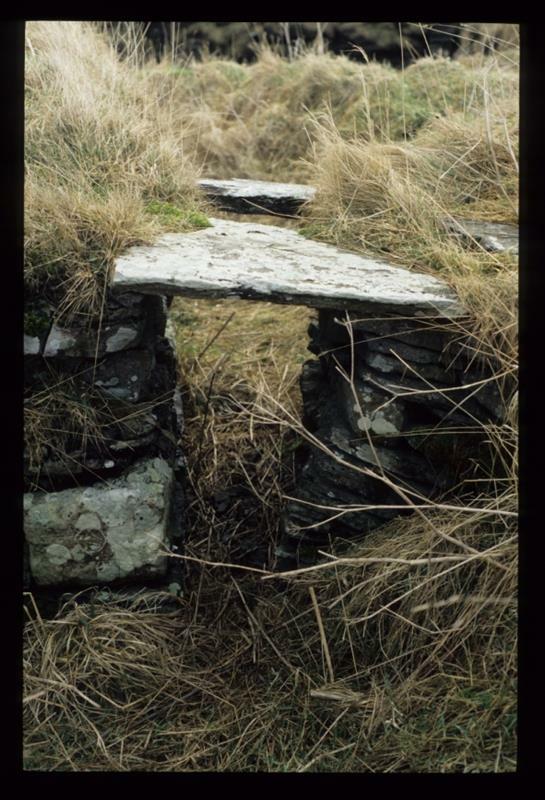 Nybster Broch - Roundhouse entrance passage (? 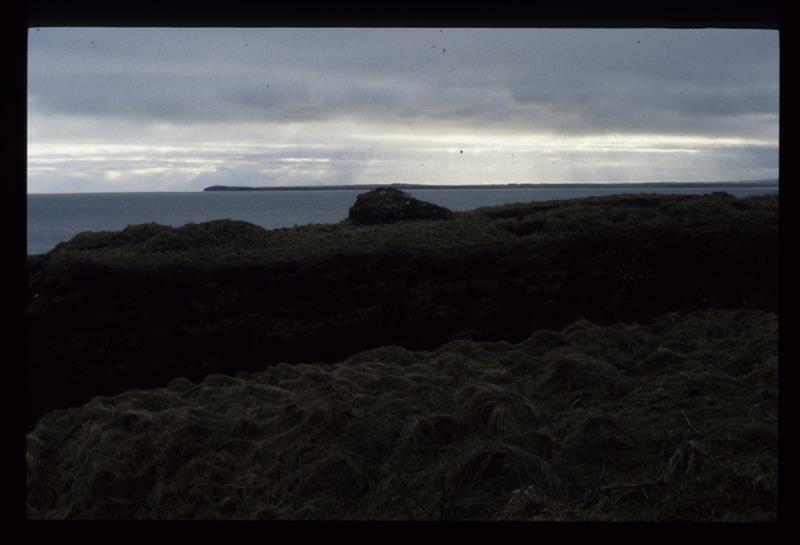 ), facing northeast. Colour Slide; Digital Image. . Original & digital. <27> Image/Photograph(s): Highand Council. 2000?. 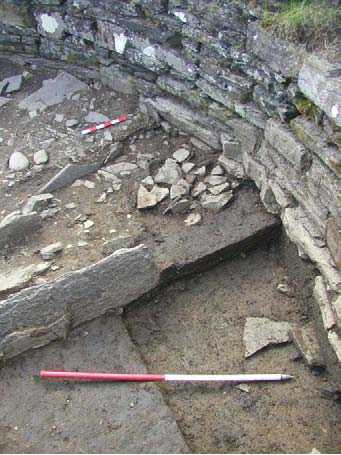 Nybster Broch - Internal features of an outbuilding. Colour Slide; Digital Image. . Original & digital. <28> Image/Photograph(s): Highand Council. 2000?. 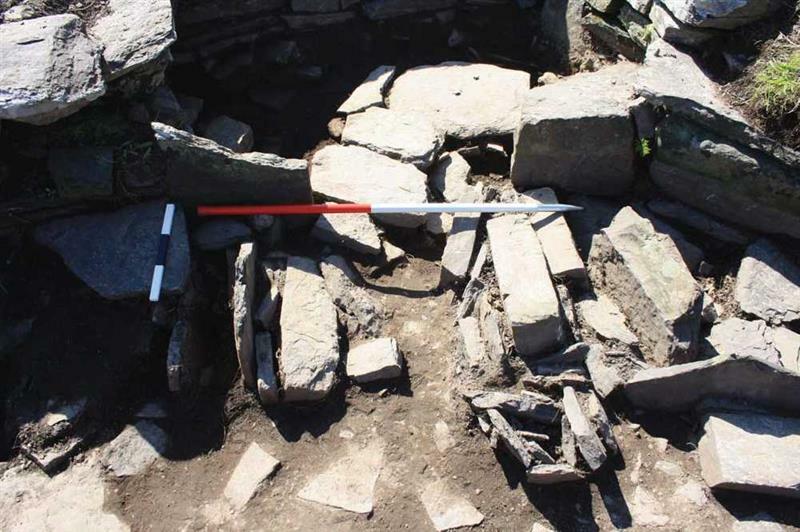 Nybster Broch - Internal features of an outbuildings. Colour Slide; Digital Image. . Original & digital. <29> Image/Photograph(s): Highand Council. 2000?. 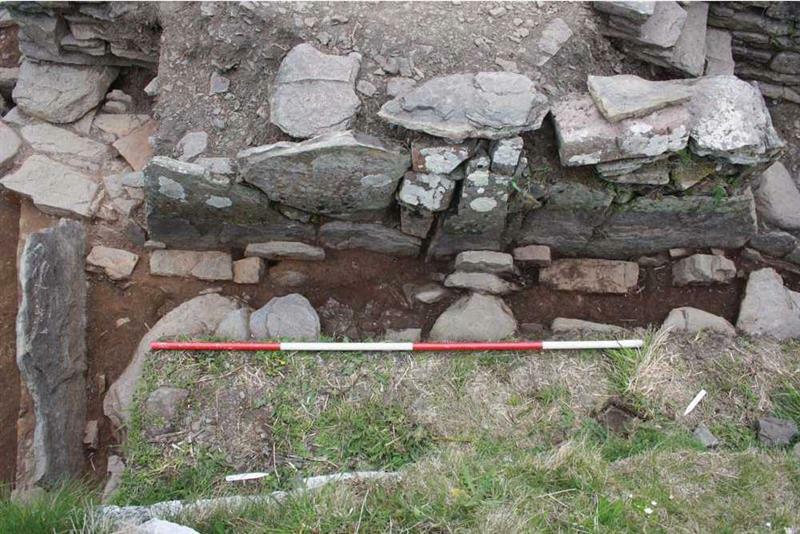 Nybster Broch - Internal features of an outbuilding. Colour Slide; Digital Image. . Original & digital. <30> Image/Photograph(s): Highand Council. 2000?. 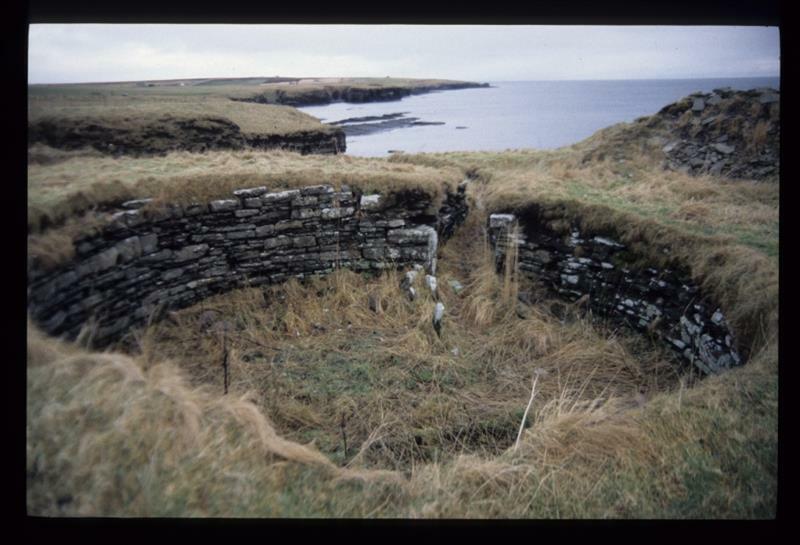 Nybster Broch - View of cliff sides near Nybster Broch. Colour Slide; Digital Image. . Original & digital. <31> Image/Photograph(s): Highand Council. 2000?. 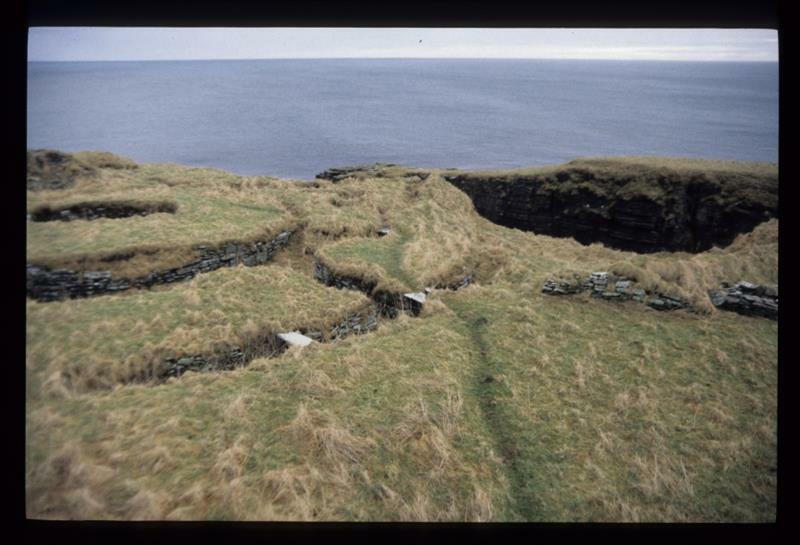 Nybster Broch - View of cliff sides near Nybster Broch. Colour Slide; Digital Image. . Original & digital. <32> Text/Publication/Serial: Turner, R (ed). 2004. 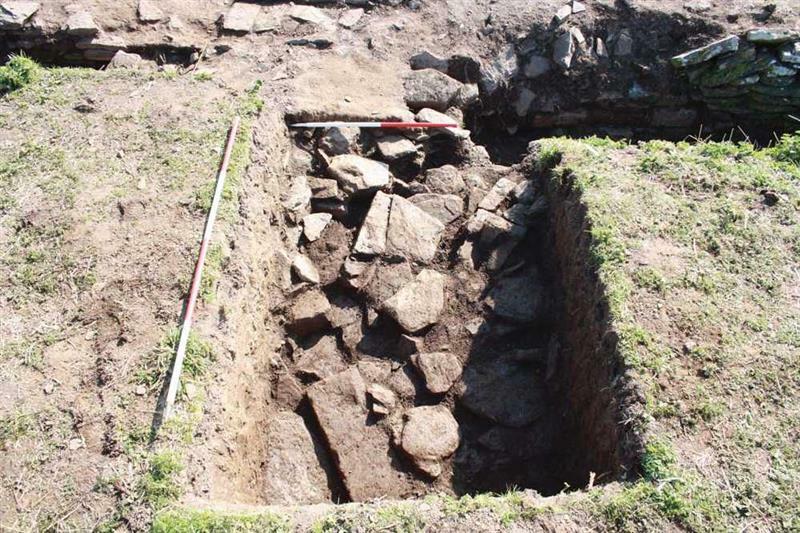 Discovery and Excavation in Scotland - New Series, Volume 5, 2004. Paper (Original). <33> Text/Publication/Serial: Turner, R (ed). 2005. 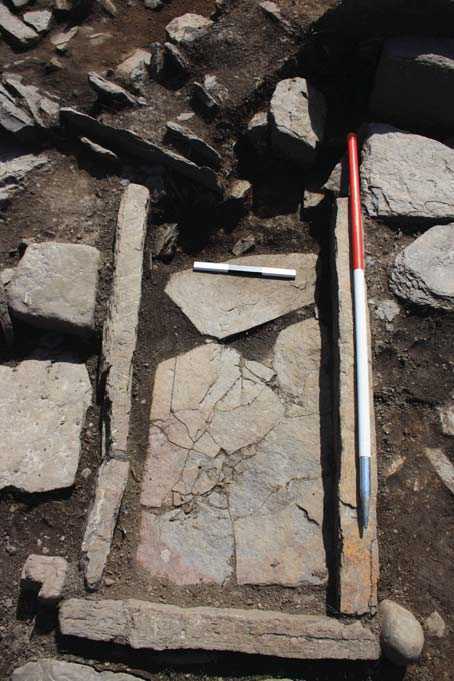 Discovery and Excavation in Scotland - New Series, Volume 6, 2005. Paper (Original). 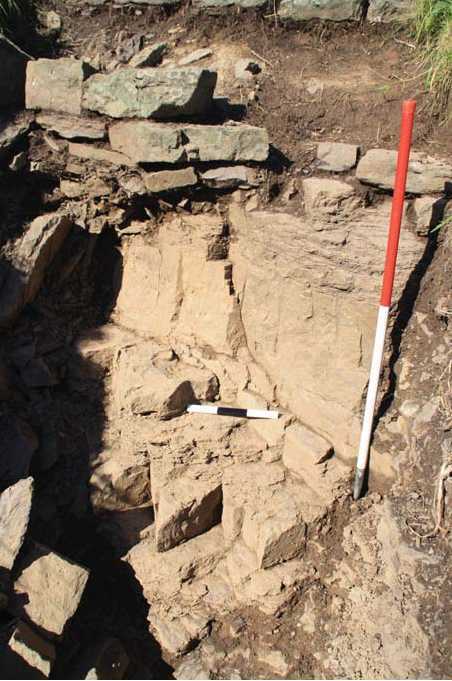 <34> Text/Report/Management Plan: AOC Archaeology Group. 2011. 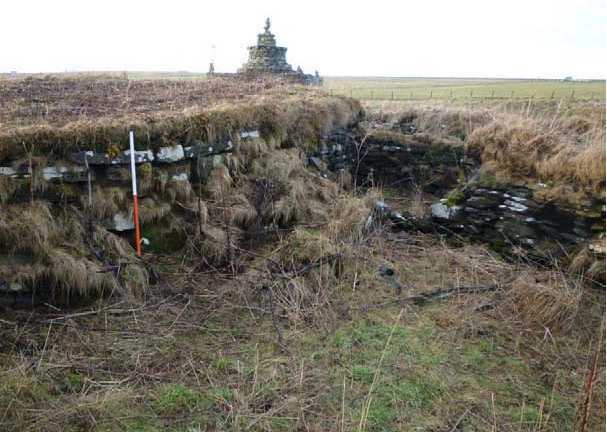 Nybster, Caithness: Conservation Management Plan. 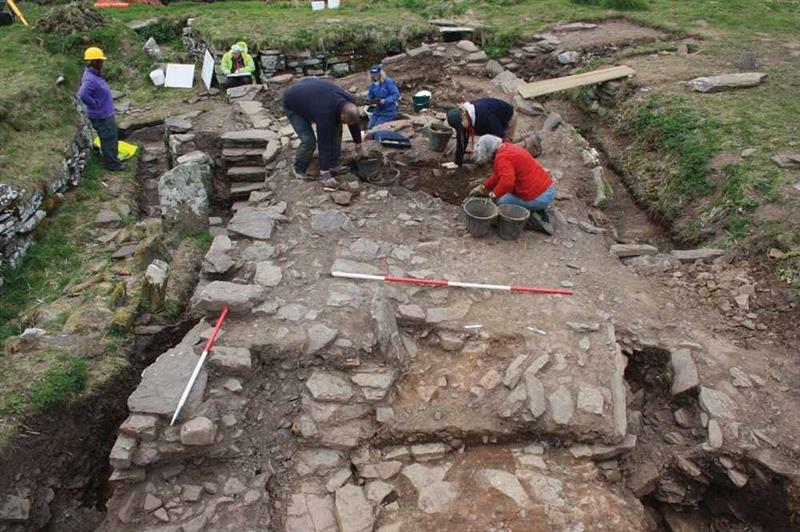 AOC Archaeology Group. Digital (scanned as PDF). 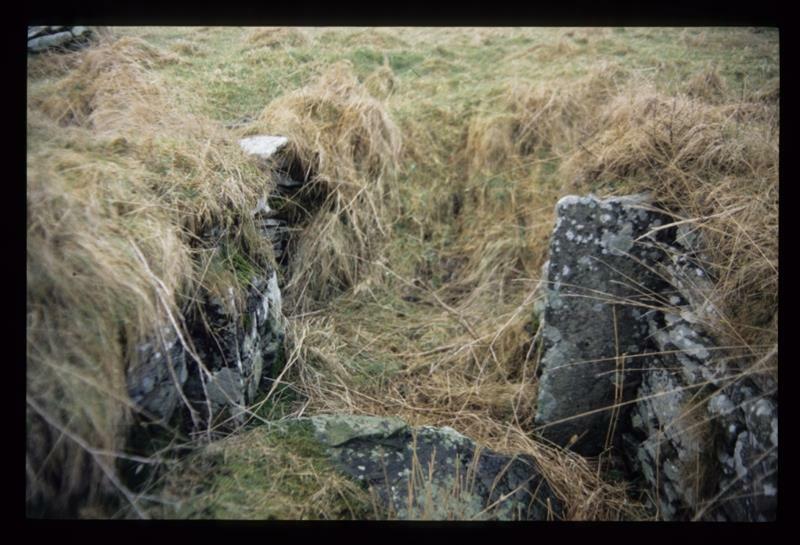 <35> Text/Report/Fieldwork Report: Cavers, G & Heald, A. 2012. 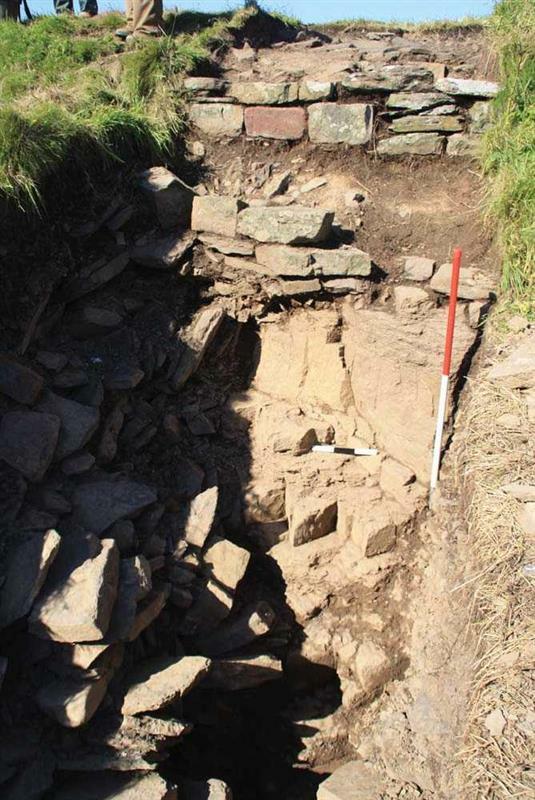 Community Excavations at Nybster Broch: Summer 2011: Final Report. 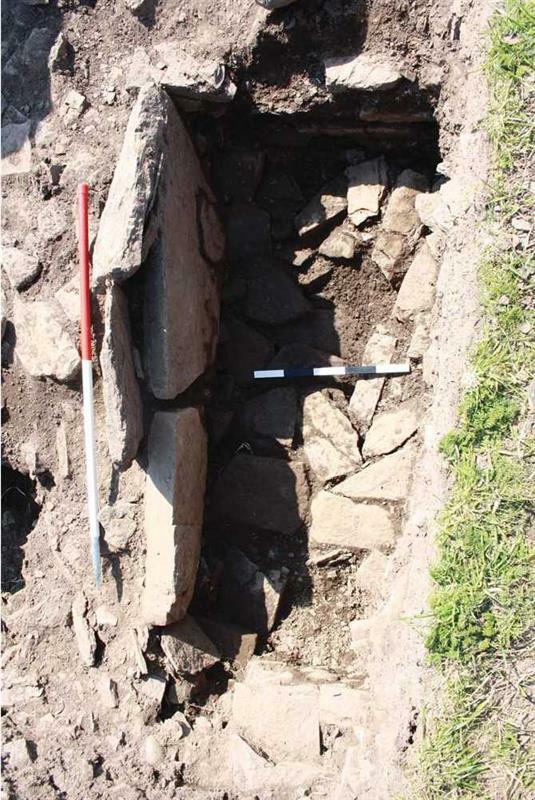 AOC Archaeology Group. Digital. <36> Text/Report: Douglas, C, R. 2012. 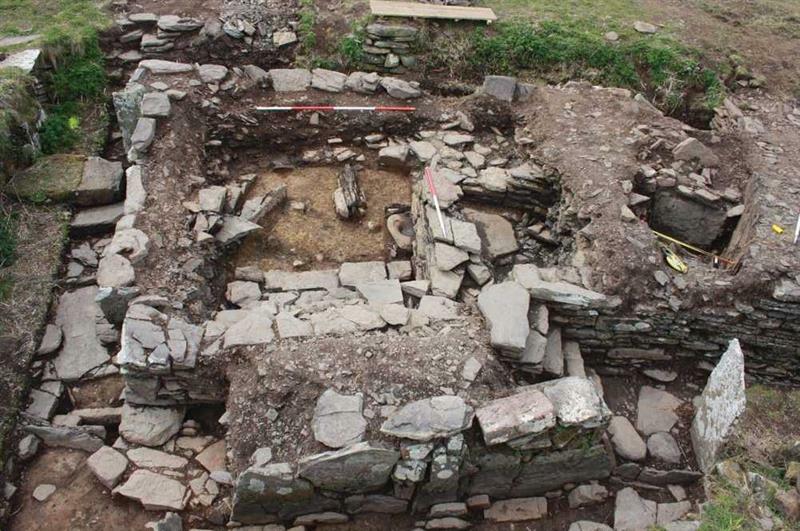 The Nybster Broch Project Community Involvement. 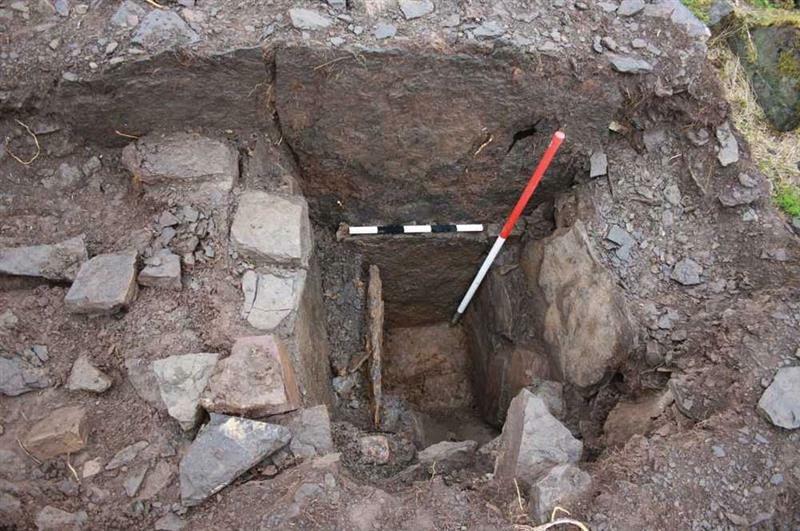 AOC Archaeology Group. Digital. 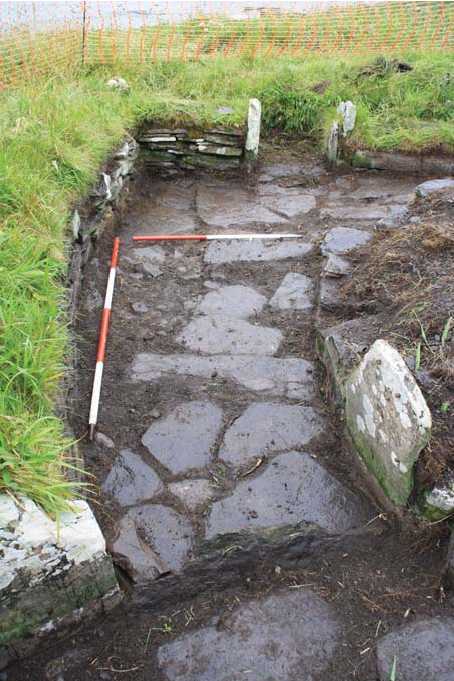 <37> Interactive Resource/Webpage: AOC Archaeology Group. 2011. 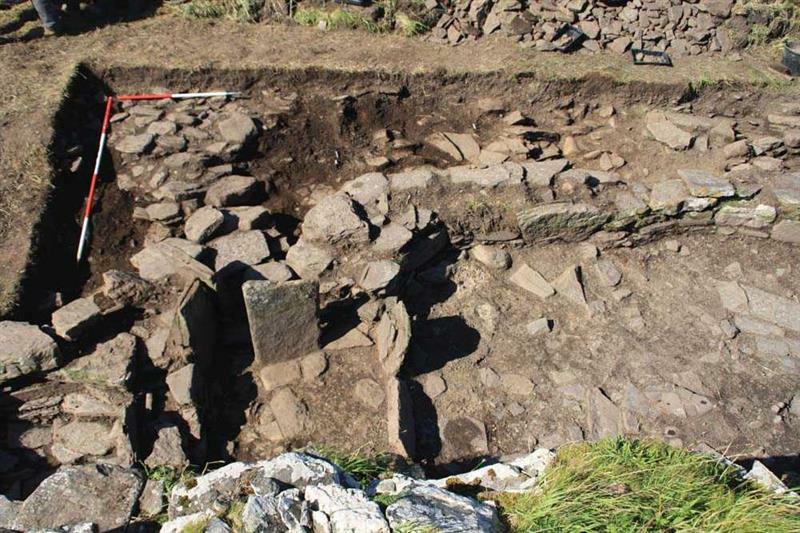 The Nybster Broch Project: Excavation and Conservation of an Iron Age settlement in Caithness. Digital. <38> Text/Publication/Article: Sheridan. A, et al. 2017. 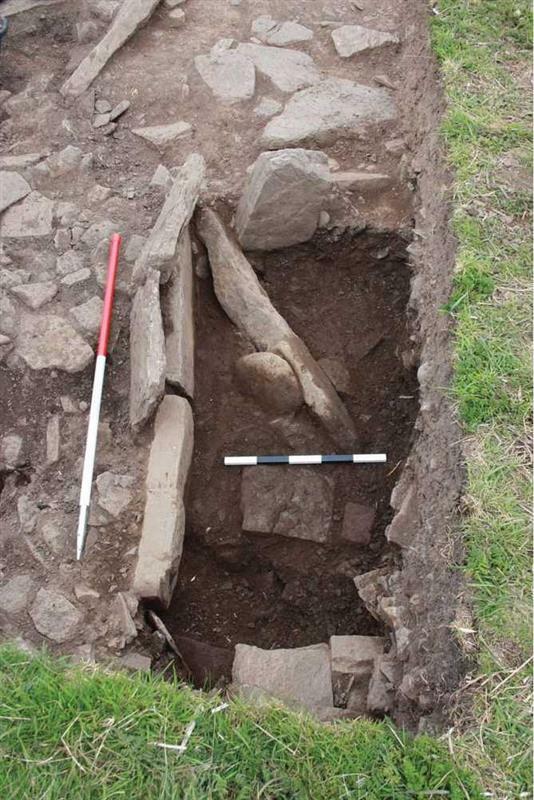 Radiocarbon Dates Associated with the Scottish History and Archaeology Department, National Museums Scotland, 2016/17. 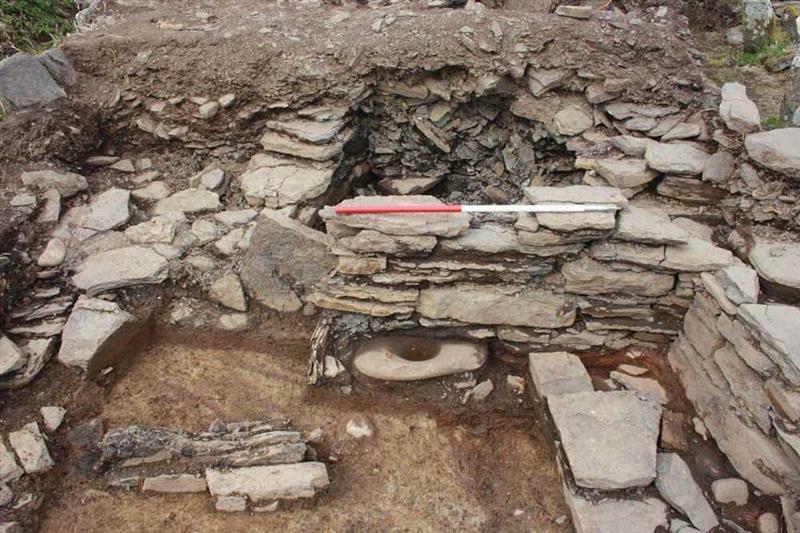 Discovery and Excavation in Scotland. 209-214. Paper (Copy). pp. 210. <39> Interactive Resource/Online Database: Lock, G. & Ralston, I.. 2017. 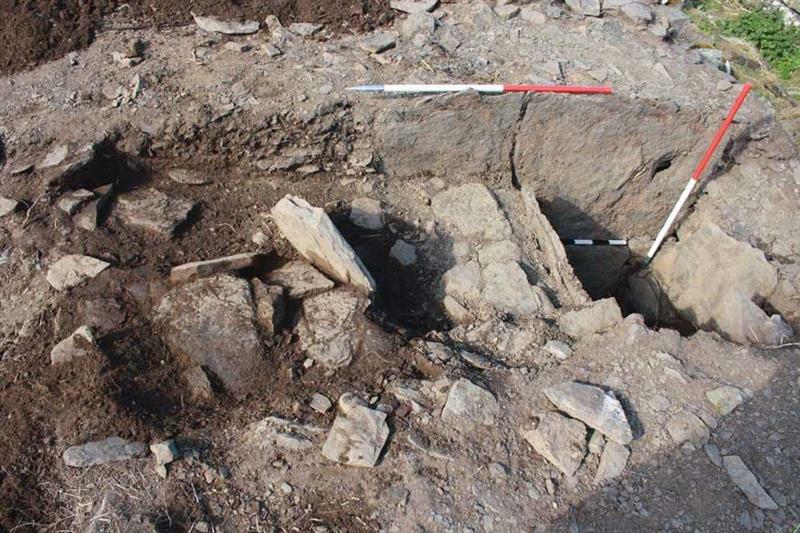 Atlas of Hillforts of Britain and Ireland. 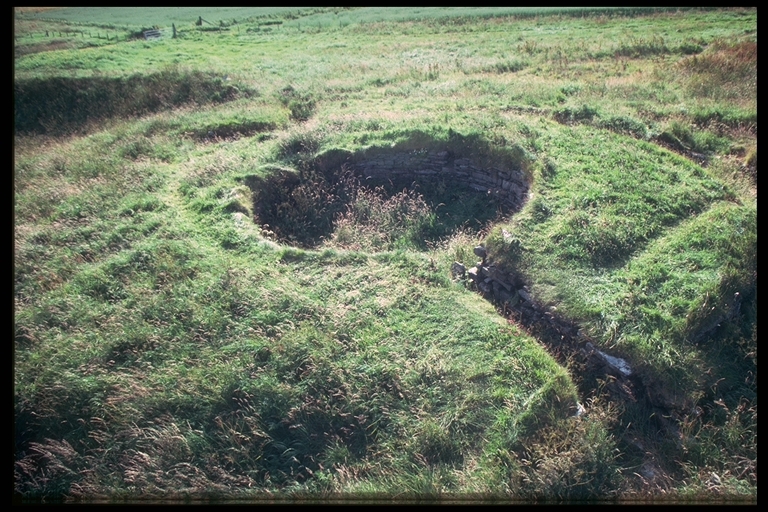 SC2820.